There are ample good reasons why the southern French region of Provence is not just a popular holiday destination, but a region whose real estate is a hot commodity with Paris socialites and the Brangelinas of the world. An abundance of sun, luscious countrysides, fields of lavender and golden sunflowers, olive trees, stone-walled country estates, azure blue‒sky seashores, beaches filled with beautiful people … what’s not to love? And don’t forget the cuisine, which is based on an abundance of fresh fruit, vegetables, olive oil, nuts and fish (the staples of the Mediterranean diet) and also truffles, chèvre, wild boar and lamb. It’s more common than not for locals and tourists alike to sip rosé while enjoying soupe au pistou (vegetable soup with pesto), grilled sardines, bouillabaisse, pumpkin soup with roasted chestnuts, ratatouille, pissaladière (onion tart) and salade Niçoise. The explosion in the popularity of the region’s wines is surely due to all the reasons previously stated — with just cause. The wines of Provence are fresh, vibrant, flavourful, immensely drinkable and great with food. I was impressed by the savoury, ripe and fresh red and white wines from Château Beaulieu, Mas de Cadenet and, in particular Domaine Ott. But it’s the rosés that are the real stars. The rosé wines of Provence account for 88 per cent of the region’s total wine production. Local wine regulations require rosé (and red) wines to always be a blend. The main grapes include Grenache, Syrah, Cinsault, Carignan, Mourvèdre, Tibouren and Cabernet Sauvignon. Fresh, dry, fruity, savoury, round and tones of mineral characterize what is generally referred to as the Provençal style. The gusty Mistral winds keep the grapes dry and healthy while contributing to the natural vibrancy (for rosé, white and red). 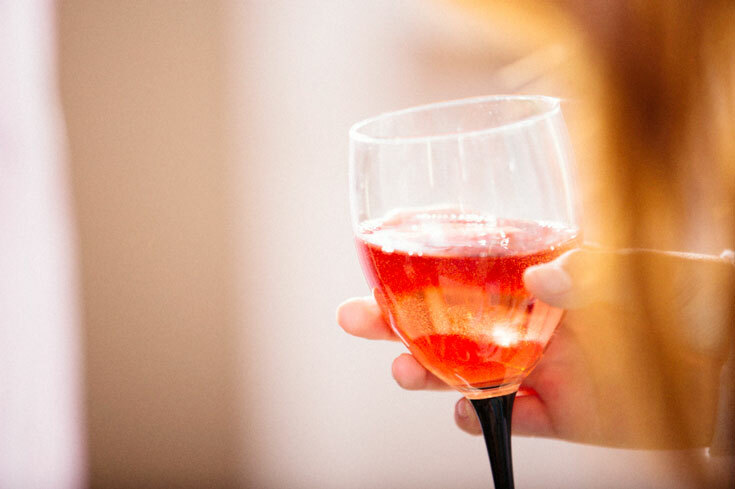 According to Vins de Provence, rosé consumption in France has more than doubled in the last 20 years and, over the past five years, Provençal rosé exports have dramatically increased. Matthieu Negrel of Mas de Cadenet has seen his rosé sales to the US double every year since 2009. Domaine Ott’s rosé wines, which sell for US$50 and are referred to in NYC as the “pool juice of the Hamptons,” are on tight allocation and always sell out. The wines are fun, well made, accessible, complex, versatile food wines and well suited to casual, unstructured meals, tapas-style dining and ethnic cuisines. Provence rosé appeals to a new generation of wine drinker free from pretentious biases and true wine lovers who drink what they like as opposed to what someone else thinks they should be drinking. They represent quality, simplicity, a focus on what’s important and the ability to leave your troubles behind (as least for a few moments). I said it while I was there and many times since I’ve been back: Provence rosé is more than just a style of wine. It represents more than just a way of life. Provence … it’s a state of mind. A lovely pale pink colour with aromas and flavours of strawberry, grapefruit and lime citrus, fresh herbs, soft texture, lively crisp acidity and a refreshing quaffability while still possessing an intriguing complexity. Perfect as an aperitif, versatile with a range of hors d’oeuvres and lovely with fresh seafood or poached chicken and fish. Grenache, Cinsault and Syrah. A beautiful fresh nose showing citrus, peach and a touch of spice with lovely flavours of citrus, a subtle, quaffable fruitiness and loads of savoury fresh herbs with great wet stone minerality and a refreshing finish. Grenache, Cinsault, Syrah and Cabernet Sauvignon. Elegant, full and fresh with aromas and flavours of strawberry, peach, fresh herbs and a touch of spice, quite minerally and chalky with bright acidity on the refreshing finish. Cinsault and Grenache. Produced to honour the French artist Cesar, who is best known for his sculptures fabricated from scrap metal, the wine is savoury and full with strawberry and cranberry flavours and loads of fresh herbaceousness; full in the mid-palate and an elegant and lingering finish. Grenache, Cinsault and Syrah. Light salmon in colour with aromas and flavours of strawberry, citrus, red currant with a hint of anise. Refreshing, flavourful and easy drinking. Great as an aperitif or with peel-and-eat shrimp. Syrah, Cinsault and Grenache. Quite complex with peach, grapefruit and spice, a bit of smokiness, good structure and depth with a full, mouth-filling texture and a long finish. A great match with grilled pork or Indian cuisine. Grenache, Cinsault and Syrah. Quite complex on the nose with bright red fruit and vanilla; full-bodied and complex with cherry, currant and raspberry, liquorice and fresh herbs, slightly leesy with elegant tannins and a wonderful round finish. Fermenting and aging in used barrels gives the wine a unique weightiness and complexity that, if tasted completely blind, one would easily mistake it for a complex red wine. Pair with everything from shellfish to duck to grilled lamb. Grenache, Syrah and Cinsault. Quite fresh with floral aromas and hints of tropical fruit, flavours of citrus, lime and fresh herbs, well-structured, lovely minerality and a refreshing acidity on the finish. Syrah, Grenache, Cabernet Sauvignon and Cinsault.